What is Fishing in the City? Fishing in the City Clinics gives city dwellers an opportunity to learn how to fish, and to fish close to home. Ponds are stocked with trout in winter and catfish the rest of the year. 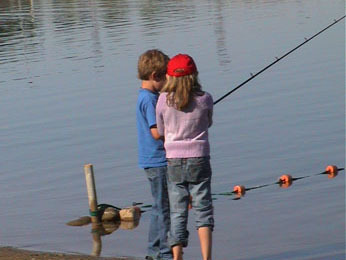 Anglers 16 years of age and older need to have a fishing license except on Free Fishing Day. The Fishing in the City Program, established in 1993, serves Californians living in the Sacramento, San Francisco and Los Angeles metropolitan areas. Richard Louv is the author of seven books about family, nature, and community, including Last Child in the Woods: Saving Our Children From Nature-Deficit Disorder. In his earlier book, Fly-fishing for Sharks, Mr. Louv touts California's urban fishing program (PDF).